during their game at Yankee Stadium on July 20, 2016 in New York City. Don’t write off “Brett the Jet” just yet. If one is looking for a great example of a bounce-back from Brett “the hitman” Gardner, take a trip back to 2015 and Mark Teixeira. After being plagued by a wrist injury, Tex was an All-Star and essentially the MVP of the New York Yankees that season, blasting 31 home runs. Before you kick him out the door, check out Gardy’s numbers from last season. The Yankees left fielder was second on the team and first among position players with a 3.4 WAR. Gardner led the club with 80 runs scored, six triples, 70 walks and his .351 on-base percentage was better than anyone not named Gary Sanchez. Plus, despite the drop-off in steals, Gardner’s 16 swipes were still second most on the squad and really aren’t too far off from what he averaged in the previous three seasons. For all of the talk of the Holly Hill, SC., native slowing down in the second half, as he appeared to in 2015, Gardner actually spiked in the second half of 2016. During the second half, his average jumped 10 points to .267 and his slugging percentage and OPS jumped to .371 and .719 respectively. At age 32, the longest-tenured Yankee earned his first career gold glove award. Hence, Gardner still gives the Yankees incredible defensive value in left field and if needed can provide them top flight range and coverage in center. In 2016, Gardy’s 1.76 range factor ranked third among left fielders and .989 fielding percentage placed him second. In fact, even with his offensive numbers from last season, if you play him in center, he’s probably viewed a lot differently if the rest of the outfield had 30 home run hitters on the corners. 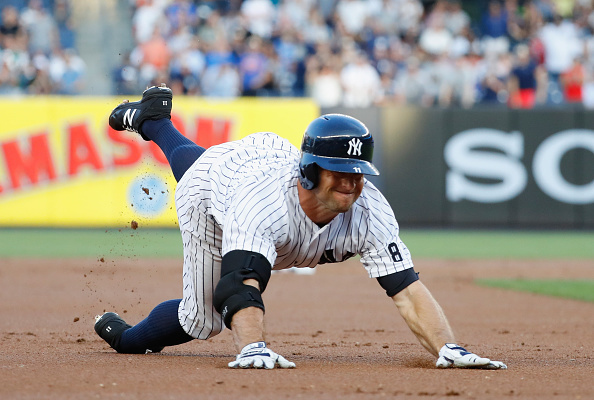 While I’m sure the Yankees would love for Gardner’s home runs and stolen bases to jump from seven and 16 to 15 and 30, he’s the most consistent and proven outfielder on the roster at this point. He may be a year older but at least you know what you’re going to get. If you get great things out of Gardner in the first half, you’re probably winning. Even if you’re not winning, you have the opportunity to sell high. As recent history shows, the Yankees have been awfully good when it comes to selling high.